When 4-year-old Sam Davidson first came to Mayo Clinic for proton beam therapy treatments, he was understandably scared. But before long, Sam was happily peddling through the halls on the way to his appointments. When Sam Davidson arrived at Mayo Clinic's Rochester campus he wasn't exactly a happy camper, despite getting a wagon ride to his first appointment. We can't blame him, given the circumstances. Four-year-old Sam had been diagnosed with a brain tumor back home in Iowa City, Iowa, after enduring weeks of ear infections and painful headaches. And he had just come off a 12-hour surgery to remove the tumor. While the surgery was successful, Sam's oncologist in Iowa City told parents Courtney and Joel Davidson that Sam would need follow-up radiation and chemotherapy treatments to keep the tumor from coming back. The oncologist recommended the Davidsons bring their son to Mayo Clinic to see radiation oncologist Anita Mahajan, M.D. His parents used a wagon ride to coax Sam out of the car and into another medical facility. But that's as far as he wanted to go. "We pulled Sam in a wagon from the car," Courtney says. "He did not want to leave that wagon for anything. He was very anxious and upset." Enter Randy Mc Keeman and his team of child life specialists. "Randy told us not to worry and that most kids end up liking him at the end of their treatment plans," Courtney says. "This was as Sam was crying and throwing a fit and refusing to let anyone even take his temperature." It turns out he knew what he was talking about. Six weeks later, "Randy has Sam running around playing basketball and loving life," Courtney tells us. And humming a different tune. "He constantly talks about how he can't wait to come in for his treatments so that he can see Randy and all of his other friends at Mayo Clinic. It's been a complete turnaround for him." Courtney tells us there's been another important factor in Sam's turnaround: the bike he rode as part of a physical therapy consultation. "He loved that bike," Courtney says. 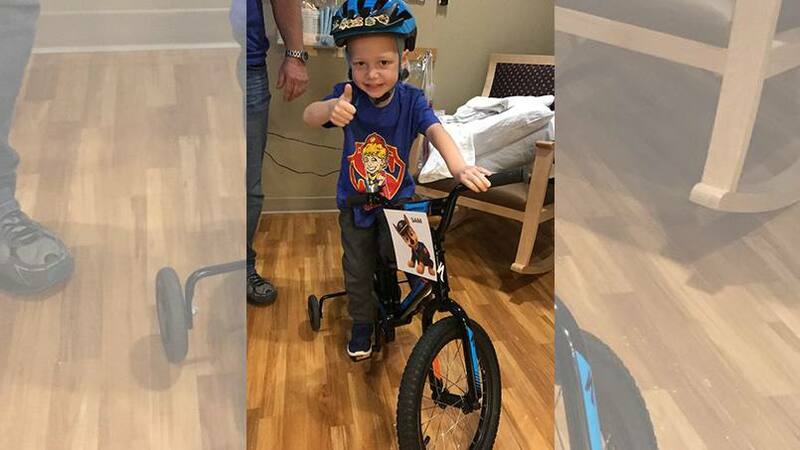 Although Sam didn't end up needing the bike for physical therapy, his care team encouraged Courtney and Joel to get Sam a bike that he could ride to and from his proton beam therapy treatments. So they did, and the rest is … best told by Courtney. "Before each treatment, we'd park on the seventh level of the Graham Parking Ramp so Sam could have a flat surface without a lot of traffic," she says. "He'd then ride into the elevator, and we'd take that down to the subway level, where he'd ride out and then navigate his way to the Jacobson Building. His nurse practitioner said she's never seen anything like it." Along the way, Courtney tells us Sam would make one very important pit stop. "A lot of people have now come to know Sam because he likes to ring the bell on his bike all along his route," Courtney says. "There's a scheduling person there at the Jacobson Building … who always lays out four pieces of candy for Sam to pick up on his way by whenever she hears his bell," Courtney says. "It's so cute." And it's just one of the many things Courtney says she, Joel, and Sam will miss. Just last week, Sam made his final ride through the buildings after ceremoniously ringing another bell to mark the end his proton beam therapy treatments. "We're obviously excited to get Sam back home, but we will miss coming to Mayo Clinic," Courtney tells us. "Everyone there has made us feel so comfortable and has taken really awesome care of Sam." Pedal on over an leave your comments below. Then, you can use the handy social media tools atop this page to share this story with others.